The veritable New Jersey rock 'n' roll outfit Electric Frankenstein have been plugging away for over 10 years with its blend of hard edged punky rawk music, and We Will Bury You commemorates that decade with a two-disc, 31-track collection of covers the band has amassed. Reading like a who's who of rock, everything from the obvious (Misfits, Motorhead, Dead Kennedys) to the obscure (F-Word, Fleetwood Mac, Pink Floyd) is covered. While a few of the covers are a bit sloppy, they're done with the pure unabashed spirit that embodies many of the original artist's recordings. 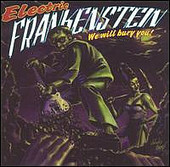 Electric Frankenstein is the kind of band that isn't shy about wearing its influences on its sleeves. Having learned from the masters of rock, this release is a loving tribute to the bands and songs that have helped shape the band into the slash and burn rockers they are today.